Quite often I say that things are going well but mention all the many things that are the signs of Alzheimer’s that Kate experiences. Today I want to do something that I should do more of – report on a really upbeat moment. This morning I came home directly from the Y instead of dropping by my office. I did so because I wanted to make sure that Kate was cleaning up the guest room for Kevin who arrives at 5:00 pm this afternoon. As it turned out, she was working on her room and getting ready to work on the guest room where he will stay. I walked over to her, smiled, gave her a hug and said, “You’re getting things cleaned up for your little boy.” She said, “And for me as well.” It was just as normal a moment as we can have. At 11:35, she came into the kitchen where I was working. She had dressed and looked ready for lunch. She asked what time it was. When I told her she said, “No wonder I’m so hungry.” We then went over to Applebee’s for lunch. We asked for our favorite server and sat at one of her tables. We enjoyed a brief conversation with her off and on throughout our time there. The meals were good. After we finished eating and paying, we just sat there another 15 minutes or so chatting, something we don’t do as much of nowadays. Just like the moment we shared in her room as she was cleaning, this was a simple but pleasurable moment in our day. It is these experiences that help both of us. This follows Broadway night at Casa Bella last night with two other couples we have known from church. It appeared to be a good evening for all – at least it was for Kate and me. She really enjoyed herself. I was happy about that because we were with some big talkers, and Kate was a bit overshadowed. The two singers were people we have seen in several different productions at one of our local theaters. I doubt that Kate remembered that, but it added a nice touch to the evening. The entertainment and the company were everything we could have wanted. I have already requested reservations for next month. These are just some of the experiences that make me feel very grateful even though we are facing rougher days ahead. Although we continue to get along reasonably well, there are instances of memory problems that occur throughout the day. For example, we came to Panera to work on our computers this afternoon. We looked for a table with an electrical outlet so that we would have access when our batteries ran out. When Kate’s battery was out she started looking for an outlet. I reminded her that we had one with our table. Then she was bothered by the sun as it began to shift and shine directly on her computer screen. I suggested a couple of chairs with an outlet in between. We went over there. In a few minutes, the sun shifted to where we were sitting. I told Kate to watch a woman at a table about 20 feet across the room from us. There was an outlet under her table. In a few minutes, Kate noticed that the woman was leaving. We picked up our things to move, but Kate didn’t know where to go. I had to point out where we were going. I normally eat lunch with Kate, but yesterday I had a meeting at 10, 11, then lunch, and then was going to donate platelets at 2:00. For that reason, I went to Panera to get her a sandwich for lunch. I asked her if she wanted me to put it on the island or in the refrigerator. She said the refrigerator. Between lunch and donating platelets, I called home to check on her. I asked her if she had eaten the sandwich. First she said yes. Then she hesitated and sounded frustrated the way she often does when she doesn’t know the answer to a question I have asked. I told her it didn’t matter. When I got home, I noticed that the sandwich was still sitting in the refrigerator. She had obviously forgotten about it. Of course, this is not surprising since so much time had passed since I had told her about it. I have often noted that Kate does not like to talk about her Alzheimer’s, but that she regularly makes indirect references to it. Here is an example from today. Last Friday her friend, Camille, invited her to lunch at noon today. I had suggested this time as I have Rotary at 12:30 on Monday. I arrived home from the office at 11:00 to make sure Kate would be ready when Camille arrived. I discovered that Kate had already come in from outside and had taken her shower before getting ready. I told her I would get her debit card for her and that I was putting a note indicating to tip $4.00 no matter what the check would be. She took the card and note which were in a small purse.” Knowing she might put it down in her room and not be able to find it later, I suggested she give it to me. She would have no part of that. Then I suggested that we put it in a place that both of us would know. She liked that. I told her I would put it on the corner of the island in the kitchen where I keep her daily calendar. She agreed to that. Ten to fifteen minutes later she walked into the family room and said, “On the island in the kitchen.” I said, “You got it. Two thumbs up.” Then she said, “Four thumbs up” indicating that she was giving herself a pat on the back. No conversation about Alzheimer’s, just a subtle statement of the situation indicating her own recognition of her own memory problem. This afternoon we went to see a movie that had been produced and directed by a man who had grown up in Knoxville but now lives in New York. In part of the movie, it mentioned that he had grown up here and showed pictures of his house and neighborhood that looked very much like a neighborhood near us. After the film, I made reference to this and discovered that she had either forgotten that he was from Knoxville or simply missed it. We had even talked with someone who sat next to us who mentioned that the producer/director had spoken to his Kiwanis club this past Wednesday. He had talked about growing up here and how that related to his adjustment to being gay. Still she missed the fact that he was from Knoxville. Tonight we went our for pizza. She walked up to the counter with me to pay. We spoke with the owner who was handling the cash register. He said something to her, and she said, “Oh, yes, you told me that last time.” This was her first time to talk with him. This is similar to what she says to me all the time. It comes up a lot when she asks a question that she has asked before; however, she also says it when she hasn’t asked the question before. I think it must be her way of covering for herself. It is these kinds of experiences that make me think that she is missing much more of what is said in conversations, plays, movies, etc. than one would otherwise suspect. For the past week or so, Kate has been getting more tired than usual. In fact, she seems lethargic except when she is outside working in the yard. Fortunately, she has been doing that more recently as the weather is not as hot. I probably would not make much of this except that it has been accompanied by less enthusiasm for doing things she would normally like to do. For example, yesterday was PEO day. She got ready without any difficulty, but she did not seem eager to go. She was very lethargic. In the car she closed her eyes as if she were going to sleep. When I dropped her off, the past president of her chapter, walked over to the car and greeted me but not Kate. Then she turned around and walked up the drive and into the house without waiting for Kate. I felt sorry for Kate. This is the kind of thing that tends to happen when people know you have Alzheimer’s. I don’t think they mean anything by it. 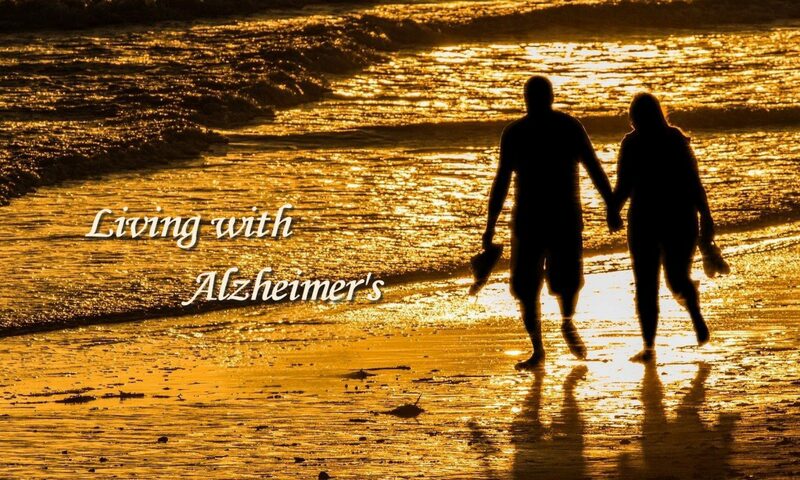 I think they believe that the person with Alzheimer’s just doesn’t notice or care. This is similar to the fact that people seem to look at me more when we are together in a social situation. I have to admit that some of this happens (I think) because Kate may communicate less than she used to do. It is harder for her to get into an extended conversation than in the past. I see signs that this is becoming more common. Another sign of this lethargy occurred this afternoon. After we returned from lunch and a shopping trip, she said she was going to try and rest. Just before 4:30, she came into the kitchen. She seemed a little groggy as though she had just awakened. We hugged. Then she said she thought she would go out on the patio. I opened the door for her, and we both went out and sat for about 30 minutes. She indicated that she was hungry and would like to eat early. I made reservations for 5:30. She seemed tired on the way as well as when we sat down at the table. She was not talkative which is not unusual. When we left the restaurant, I commented on the fact that it was early (6:30) and said that we could watch the movie Breaking Away when we got home. She indicated that she would be ready for bed. We had not gotten very far in the movie when she started falling asleep. I turned the TV off. Before we left for dinner, Camille called me to say that she would like to invite Kate to lunch sometime and wanted to know when would be a good time. I suggested this coming Monday. I told her to call back for Kate on the landline, and she could ask Kate but first we should establish the time so that I could make sure she is ready. We decided on noon. In a couple of minutes she called back, and I put Kate on the phone. She was thrilled that Camille had invited her. I will have to tell Camille how much this meant to her. These kinds of things have made me think once again that Kate is going through another period of decline. First, it was the decline in short-term memory. Now it appears that she is losing the ability to focus on things which leaves her with little to do. This may be exacerbated by having to work so hard to follow things that she is withdrawing a little bit. At the same time, she is working so hard that she is worn out.